Originally scheduled to be out in September, HANDY MANNY and friends is reportedly available now and showing up in WAL MARTS. These characters are based on a Disney Channel animated program. A Click-N-Play WINNIE THE POOH series is a new release in Europe. A new European release is a new series called LITTLEST PET SHOP. There are about 1000 characters in the Hasbro toy line, so this could be a BIG series. 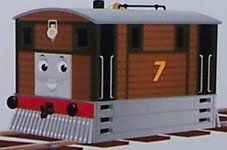 An new engine is out - TOBY - to add to the THOMAS THE TRAIN series.